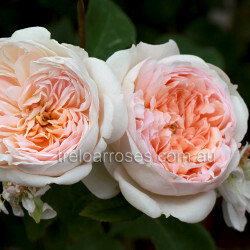 (Koraddilu) - A distinctive sweet aromatic scent drifts in the air from this aptly named rose. 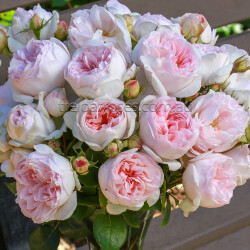 A strong, healthy upright bush produces deep open cup shaped blooms in loose clusters, as well as individually to a stem. The petals are firm and last well as a cut flower when blooms are cut at the half open to open stage. Colour varies depending on the sun intensity from candy pink to creamy apricot. Approx. 1.5m tall. Awarded Certificate Of Merit & Most Fragrant Award at the 2014 National Rose Trial Garden awards.